Everyone knows that it is advantageous to be ranked high on Google’s organic search results, and that a generic keyword domain name can get you there. Among generic domain names, the crème de la crème is a single-word, industry-defining domain name – such as toothpaste.com. But even with the inherent superiority of such a domain name, its value is undermined if the company that owns it does not develop a useful website on that domain, a website that can reach the top rankings of search engines. Such is the case with toothpaste.com, owned by the Procter & Gamble Company (P&G). P&G is not capitalizing on the marketing value of its domain name and, as a result, spends money it should not have to buying supplemental pay-per-click (PPC) advertising. By not putting toothpaste.com to full use, P&G wastes more than $500,000 every year. When search engines like Google index websites, they take into account many factors. Of all these factors, having an exact-match .com domain name with the search keyword is one of the most powerful ways to rank a website at the top of the results. 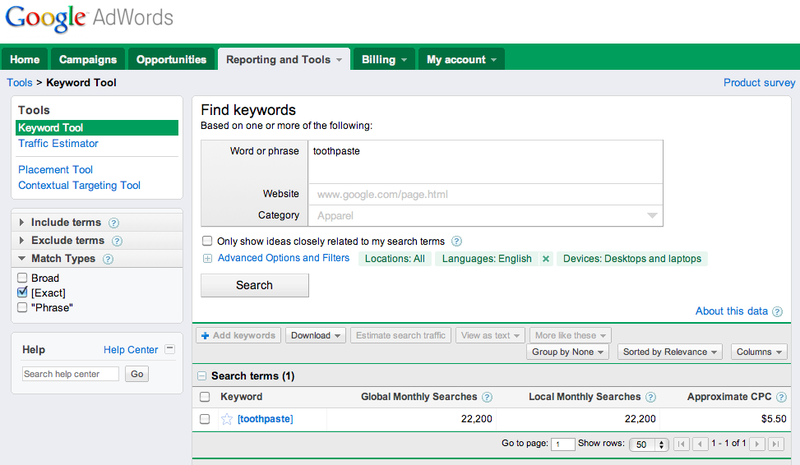 Beyond keyword matches, brand is becoming an increasingly significant factor in search engine results. SEOmoz Q&A Manager Lindsay Wassell noted, “Exact-match domains, while still highly effective today are beginning to wane in power. Google is getting better at distinguishing between ‘domain ownership because it is the company name’ and ‘domain ownership because it is a valuable generic term. '” That trend gives an advantage to large brands – such as P&G, Bank of America, and Microsoft – that also own generic keyword domain names. In one of his regular YouTube webmaster Q&A videos (below), Matt Cutts, the head of the Search Quality group at Google, confirmed that big companies are ranking high for major keywords as a result of the “trust, authority, reputation, PageRank and high quality” that their brand, company and website provides. In other words, customers instinctively trust large companies with known brands over small companies with unfamiliar brands, and that preference is being reflected in search results. If a well-established company were to combine those two factors – a trusted brand with a fully developed generic-keyword domain name – they could hit the jackpot in search result rankings. 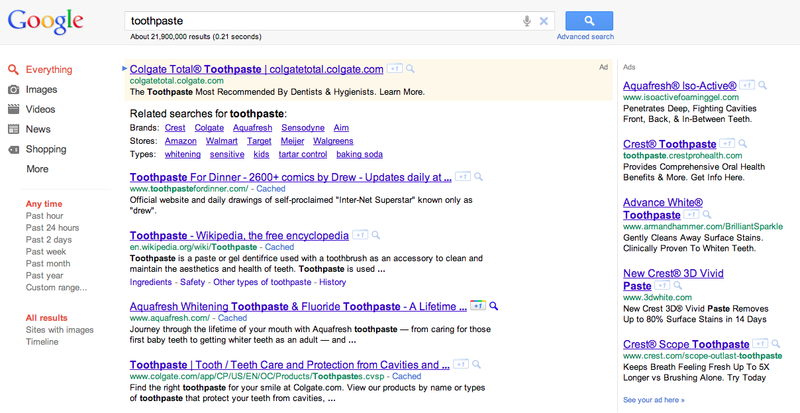 With toothpaste.com, P&G has the potential to do just that. Delivering high quality information means that the search results will favor a website with original content that provides specific information on the topical search. 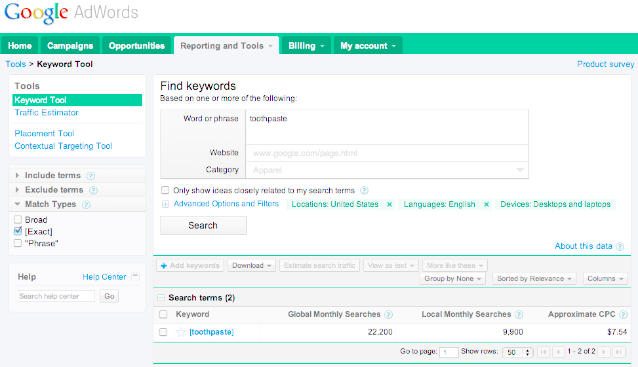 Christian Walter, chief technology officer at NowYo.com, points out that Google gives websites with a generic domain name a chance to rank at the top of the organic search results. If a user of Google searches and clicks on a link, the user then takes one of two actions at the resulting website: 1) stays on the site and continues to browse because it provides useful information, or 2) hits the back button, returning to the Google search results to try another link. Google can determine what the user does in either case, and if the latter, then Google stores that information – that the website was not useful to the user for that specific query. The big deal about ranking well in organic search results of course is the marketing exposure a company gets for very little cost. But just how much is that marketing exposure worth? 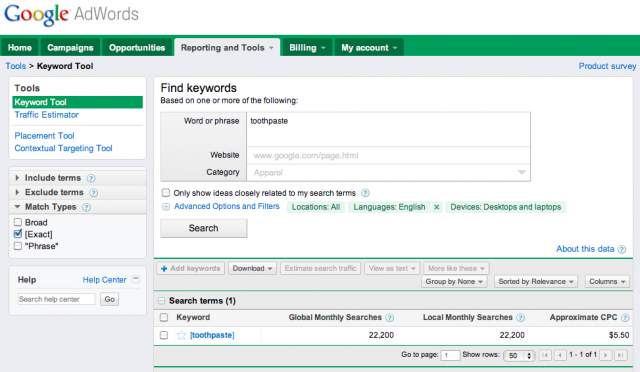 Based on the Google AdWords information below, the equivalent marketing value over a 12-month period of toothpaste.com is $313,513 if focused only on the United States search population, or $523,530 if focused on the worldwide search population. P&G is the world’s biggest advertiser. The company spent more than $9 billion in fiscal year 2011 on advertising through TV, newspaper, radio, Internet and billboard ads. Although P&G does not disclose how the $9 billion breaks out by advertising channel, trade publication Advertising Age reports that the company’s top-spending brands in the United States were Olay, Cover Girl, Gillette, Tide and Crest. P&G clearly recognizes the power of marketing (and is not afraid to spend money on it) – the company has built its market capitalization of $170 billion through superior marketing over 174 years in business. And in the purchase of toothpaste.com, the company demonstrated that it understands the value of a generic industry-defining domain name. However, owning a generic domain name is not enough. Like many companies, P&G has failed to make full use of the power of domain names in advertising and marketing. It is understandable really. The intricacies of using domain names as an advertising channel are unfamiliar to most Madison Avenue-type firms, which are likely to be managing the marketing efforts of large brands. Such agencies generally are valued for their creativity and campaign management, not for negotiating the purchase of domain names and developing search-engine optimized websites. In addition, many advertising agencies make a flat commission from managing the annual spend of their customers’ marketing budget. That makes pay-per-click (PPC) advertising a favorite recommendation to include in a customer’s marketing plan – the more a customer spends, the more an advertising firm earns. Show its advertising firm and/or in-house marketing team this article. Notify them that domain names must be part of their strategic marketing plan going forward. 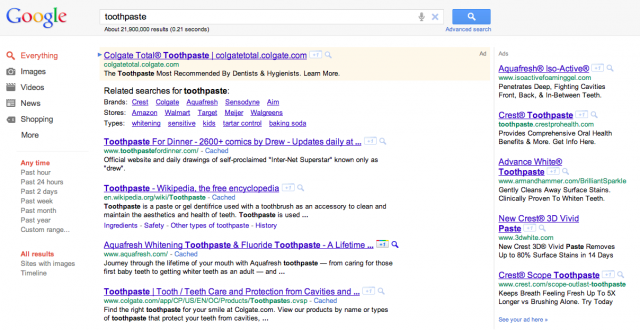 Identify all generic domain name assets currently owned by P&G that are underutilized, such as toothpaste.com. Identify all other generic domain name assets that P&G should own, and complete a return on investment analysis for acquiring such domain names. Acquire domain names, as appropriate. Shift marketing resources to developing a definitive website resource on available domain names, using the skills of a search engine optimization professional. Reduce online PPC advertising on a weekly basis aligned with the increase in organic search result click-throughs from Google and other search engines. Send DomainSherpa.com a thank you note, and provide its shareholders an update on how its leaders are being better stewards of their investment. Advertising and marketing plans for domain names should not end with acquiring the single-word, generic, industry-defining domain name. Type-in traffic is not enough to support a proper return on investment, nor should it be enough for a company’s tactical marketing plan. After acquiring a generic domain name, like toothpaste.com, a company needs to set up the definitive site for that topic. Doing so will not only produce a revenue generation opportunity, but will also reduce a company’s ongoing advertising expense. Large companies in particular can combine the power of their brands with generic domain names for the best rankings on search engine results. For P&G, developing out toothpaste.com and moving to the top of the organic search results could lead to an annual savings of more than half a million dollars. As I suggested to the blogger who has been running the series that covered this and other unused domains, I wish you’d contact the advertiser to get their side of the story. In past lives that would have been me. And that they are a holding company that owns brands that sell toothpaste. They have spent billions to build those BRAND names and the message is that all toothpaste is not equal. And I think publicity that most of these generic names bought by end users aren’t used actually hurts our case in the field when trying to sell domains. Amazing how many companies and individuals waste such domains when they could really help. Half a million dollars a year is a lot less than the benefit they could get by using that name. Terrific article. I really enjoyed reading your analysis and learned a few things along the way. Thanks. What a great article. Clearly demonstrating how a massive company is losing money by its own ignorance. I wonder what the shareholders think, after all that is their money that is being recklessly squandered. I hope this article has been posted to P&G Board members. The power of domains, the weakness of ignorance, and the failure of management and consultants all demonstrated in this one piece. Thanks, Bill. Ignorance is a good way to put it. I’m sure that they have no idea about the power of keyword generic domains owned by big, trusted brands. I hope this article not only opens the eyes of P&G, but everyone else that owns similar domains. Enjoy the tail-end of summer….looking forward to chatting again soon! Andrew: you have quite the plan brewing! Glad you enjoyed the article. I hope it opens up the eyes of corporate marketing professionals. It can be very valuable to rank at the top of Google, worth hundreds of thousands of dollars a year…if they only knew. Great article Michael! It’s a shame they don’t know what they have in their domain name. Another example of advertising companies ripping off their clients. I can attest to the fact that getting ranked for exact match domain names is getting much harder than it use to be. You have to work at it just like any other domain to get them ranked! Thanks, Peter. Glad you liked the article. I didn’t mean to demonize Madison Avenue-types, but I have seen it be the case where those who are motivated by commission have their behaviors modified by the almighty buck, rather than what is in the client’s best interest. I’ve also spent too many years in corporate America to realize that it’s very easy to outsource something and forget about it. While I agree with you that it is getting harder to rank high for an exact match domain, P&G is in a unique situation: old domain, owned by a large company with trusted brand, selling exactly what’s advertised in the generic keyword. You can’t get more opportunity than that! What is even more distressing is Google admitting they give more “weight” to the big players in search engine results! I’m sure it has nothing to do with big corporations spending millions on Google advertising! So much for equality in organic search results! Great analysis. There are excellent generic names without content. But $500.000 a year with toothpaste.com? Interesting. Thanks, Martin. Glad you enjoyed the article. My analysis is open for discussion. It’s merely one way to evaluate how much a company is spending on advertising. The Rosener Equation is good, but it has assumptions which can be debated. Having said that, I think it’s a safe assumption that one of the largest companies in the world, who spends more than $9 billion a year on advertising, is at least spending $500,000 a year on their multiple toothpaste brands through online advertising on search engines. Excellent analysis. Hopefully they’ll take it into account and use your advice. Thanks for all the other information on your videos, i´ve been learning a lot by watching them all. Cheers. Thanks, Tomas. I’m glad to hear you’re enjoying all the DomainSherpa video shows. Cheers! I guess it goes to show that businesses still need to be educated about the potential of generic domain names. Very interesting post every marketing professional should read. Really, really good. Thanks for your kind words, Aish. I’ve been watching P&G (Protor and Gamble) since 1995. What most people do not realize is that it wasn’t the company that registered these names but a techie in the company that “should” have registered them for himself but did so for the company he worked for. He must not have realized at the time how valuable they would become. In my opinion, P&G has had no real understanding of what they had/have or who registered these names. Disney is another matter. They had close to 1200 names in the mid-90s and were way ahead of the rest of corporate America. @Michael: great information. I wasn’t aware of any of those details either. I hope the original “techie” who registered the domains emails me so I can ask her/him more about their vision for the future of the Internet. That would be an interesting story. The contrast of Disney to P&G is a great one. Fantastic summary of the problem that most companies face. They have no idea that domain names should be a part of their marketing activities. Well written and a great story to read. “Yippee for Skippy!” — classic! Thanks, TJ. Glad you found benefit in the article. It’s a testament to Unilever’s marketing prowess as well.